Have you been using the PowerOptions Portfolio tools to help track and manage your options positions? If not, now is a great time to start! Profit and Loss Portfolio tool tracks your current positions as linked trades – meaning your covered call position will have the stock and call option linked together rather than separately. View Original Expected Gain vs. Liquidation Value vs. Future Expiration Value for the entire position, not just the individual leg. Historical Reports and Analysis view to see the total gains on rolled or continued positions. Allocation views to evaluate your Portfolio diversity and exposure. Alerts for each position to notify you when you may look to roll or adjust a position. Position Analysis tool to evaluate your current position, roll out opportunities and simulate trade feature to see the before and after picture when considering an adjustment. The Position Analysis tool is a very powerful tool to help investors quickly evaluate the new % return and potential outcome of a roll out opportunity or adjustment. 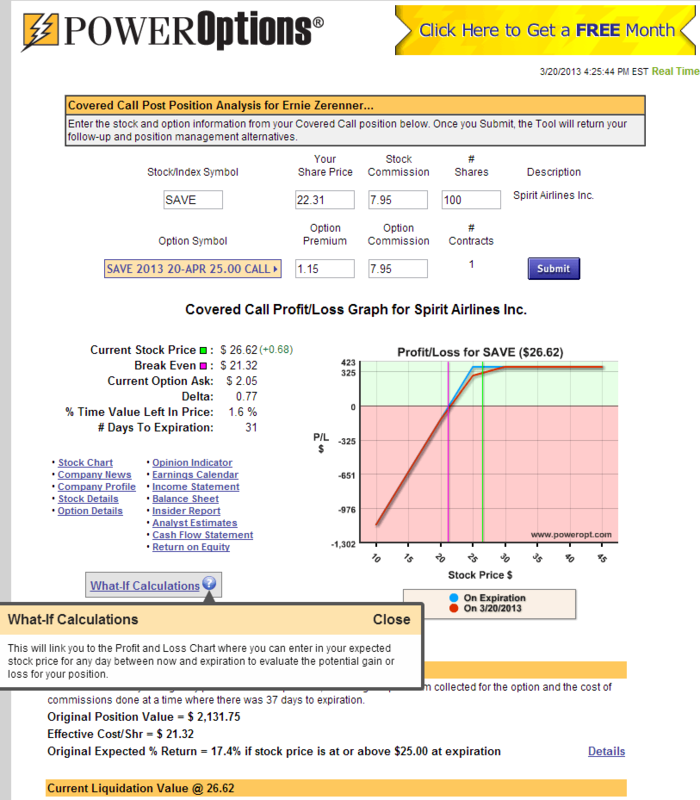 We have recently enhanced this tool to include a ‘What if Calculation’ feature so investors can evaluate the potential gain or loss on their current position if the stock was trading at a certain price on a certain date prior to expiration. 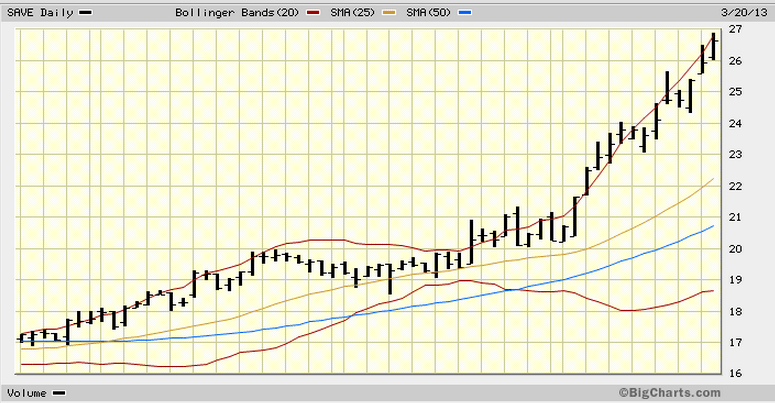 Spirit Airlines has advanced sharply over the last month and is currently trading above $26.00 per share. Using the ‘Stock Chart’ link next to the Profit and Loss chart we can analyze the current trend of the stock. The Bollinger Bands and RSI both indicate that Spirit is probably over extended as can be seen in the graph below (for a detailed explanation of Bollinger Bands for stock evaluation view our article here). The stock price is 104% of the Bollinger Band range and has an RSI of 97 out of 100 maximum range. At today’s close the position has a profit of $368. It would be nice if Spirit would continue to advance at the current rate, but what if Spirit drops in price to $24 in the next few weeks? 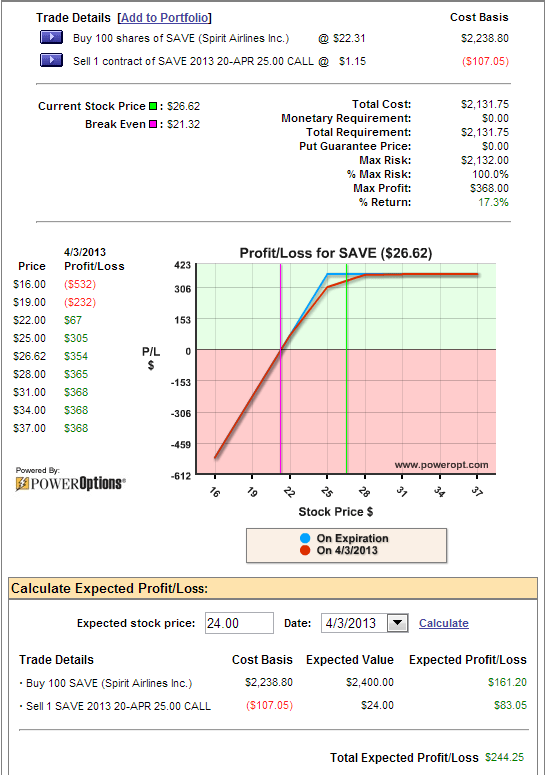 Clicking the “What-if Calculations” link takes us to the Profit/Loss chart that will allow us to insert a price of $24 per share on a target date of 4/3/2013 to evaluate the theoretical gain or loss on the SAVE position. Originally we had a $368 gain on the position for a 17.3% profit. But if the stock price of Spirit Airlines were to fall to $24 by 4/3/2013 the position would only be worth $244.25, a loss of -$123.75 from the present price if liquidated today. Since this is a covered call position the upside is limited, but the downside is not. There are several alternatives that can be explored with this “What if” page. If we are concerned about a reversal on SAVE we can now evaluate rolling the call down in price to help generate more premium, or protect the position with the purchase of a PUT option and limit any lose due to a decline. On the other end, if we expected the stock to continue the current upward trend, we could evaluate rolling the call up in strike price to allow more room for stock appreciation. Of course, if we have met our goals there is the alternative to liquidate the current position and be happy with the 17% return. Different price points and dates can be inserted and calculated to examine other what if events. A graph and table of results are shown for each event once you have entered in your Expected stock price and target date. Both of the first two alternatives involve the use of substitute or additional options. These option positions can be explored from this “What If” page. At the top of the page investors can select alternative options to sell or buy against the current position to evaluate the new potential return of at risk amount. This is just one feature in the Portfolio tools that will help you evaluate your current positions and quickly compare the current return vs. future expiration value vs. the outcomes of any number of roll out opportunities or adjustments. If you would like to see more on how the PowerOptions Portfolio tools can help you track and manage your positions check out our archived webinar, PowerOptions Portfolio Tools located in the PowerOptions Tools Archive section of our archived webinars. This tool was one of the reasons I decided to open an account. Now, I can’t find it. Would someone please send me some navigation instructions to get to this tool? Thanks. Hi HW: Once you are logged in, look for the MY PORTFOLIO tab. Click that and you will have a sub-tab for PROFIT/LOSS PORTFOLIOS. This is where you enter your current positions or new positions or paper trading position. Once you have that done, you will see a blue MORE INFO button next to each position. Clicking that will give you graphs and further research choices for the stock and option(s) that are in the position. You will also see a menu item that is POSITION ACTIONS as you mouse over that you will see a sub menu with POSITION ANALYSIS. Hope this helps! If you continue to have troubles, just call the office toll-free during market hours or schedule a free coaching session with us.